Awwww shucks! Looks like my homegirl ATLien bagged her Bob Whitfield! I recently caught up with the NFL offensive tackle in a phone interview. He dishes about his old love (ShereÃ© from Real Housewives of Atlanta), his new love (ATL of StraightFromTheA.com) and where exactly all his money is! Bob Whitfield: You can never not…you know you can always say, “aww yeah, I don’t wanna have kids. But then all of a sudden, someone ends up pregnant and then you have more kids. FreddyO: So you saying you want more kids? BW: Nah, I just finally got done with my one kid. But you never know how, you know, things happen. You know. FreddyO: So I have an exclusive? BW: Why is this so important?! I don’t understand. You been followin’ ShereÃ© around or sumthin? FreddyO: Nah I haven’t been following ShereÃ© around nowhere. FreddyO: Nah, I ain’t talked to ShereÃ©. Freddyo: I talked to Sheree a couple weeks ago but it wasn’t nuttin about dat. You know, I was just asking her, you know, she probably still love you. She love you man.You done found some new love. You done found my homie ATLien. They all booed up. That’s gonna be. Un uhh and y’all gone have some kids. Ain’t dat crazy? FreddyO: How long y’all been talking? BW: Hmmmm. I don’t know. Past <inaudible> I guess. A couple years back. FreddyO: Cause she been riding really nice. 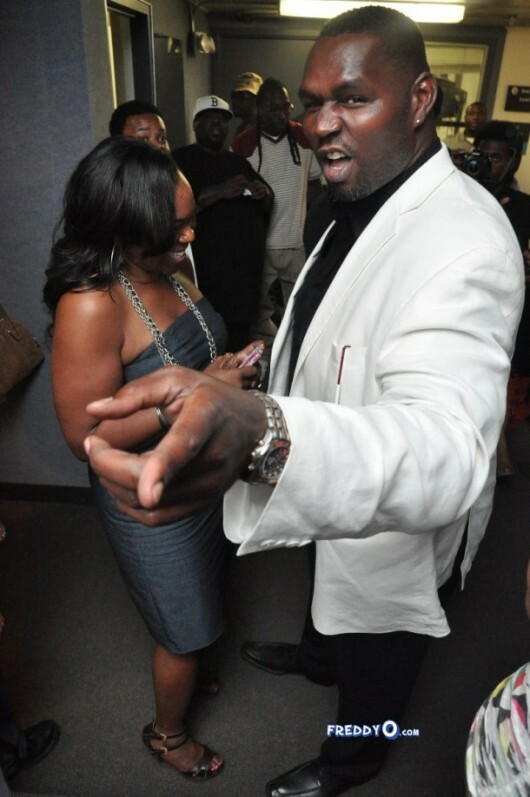 BW: Look, you know I don’t got no money Freddy, Sheree got all my money. So the only thing I can buy her is dinner. FreddyO: All you can buy her is what? FreddyO: No red bottoms? Michelle, I don’t know if ATLien need to stay witchu. I mean they sad but see no this is what I heard, word is on the street that you stashing all the money somewhere and that you just uhhh took all the money out of the bank accounts and you don’t want nobody to know. BW: Look, even if I did take all the money, take it out of the bank account and didn’t want nobody to know, if the streets know already, then its already known. And they say that about everybody who do that, “nah he doing this, he doing that.” Why can’t I just spend all the damn money? BW: Shopping sprees, s***, trips. All kinda stuff. FreddyO: No, but see, this is what we know, we know you kinda gangsta and you wouldn’t have just spent all the money. You was gone save some of the money and we know, cause you know, we living good. But you know how to live right, see you could sprinkle money wherever you want to, when you want to and you could touch the money. And see I think that’s what ATLien like. She know that she can touch the money sometimes. She wanna touch some money. BW: See, This what you got with Michelle, one, you got a smart business woman. So, being that I been in Atlanta all these years, its probably very few times when you’ve run into the ultimate package of brain and intelligence and the whole nine yards that’s mixed wit charm, appeal, you know, and uuhhhh a good demeanor and head on her shoulders. Because what everybody in Atlanta <inaudible>, even the smart girls decide to be strippers. S***, they going to college for a medical degree and they stripping at Magic City on the side, so. With the respect factor, it makes for, you know, a lot of mutual respect just on, regardless of “oh, y’all uh dating or you a couple?” You think it’s more respect to the idea of a relationship with someone that is upwardly mobile. BW: Â Why don’t you say if means that we about to make a s***load of money? FreddyO: Yeah, I mean, well we knew that. But do you think its gonna be any kind of issues later on from any of your past friends/lovers? BW: Nah, nah. I think once you get to this stage in adulthood ain’t nobody mad, they just want something that they can come home and talk to. Everybody just want someone that, you know what I’m saying, they’ll listen to what they say and I didn’t say that, Kobe said that. You just want somebody you can talk to no matter what you say. FreddyO: That’s wussup. Ummm. Somebody callin. Well yeah, I can put this interview up? BW: Alright, hold on Freddy. Freddy? BW: So look, Freddy, I’m gonna talk to you in a little bit. In about two weeks about some real s***. So just be ready for the phone call. FreddyO: That’ll work. Thanks man. 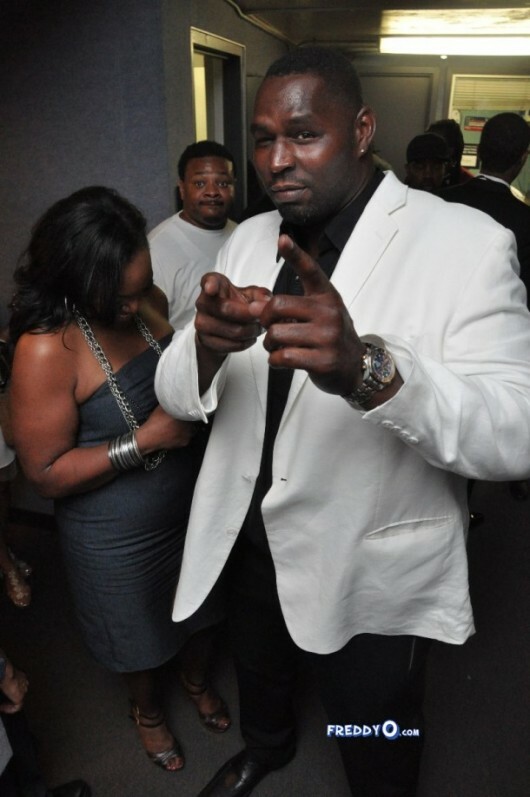 Sheree’s Ex husband Retired NFL baller Bob Whitfield speaks out on court episode of RHOA! I’ve seen them out together. They make a really cute couple but he seems a little slow.